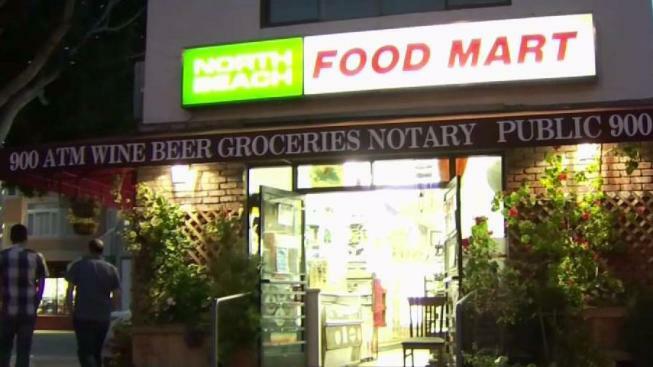 An 85-year-old store owner who was knocked down by a fleeing shoplifter in San Francisco's North Beach neighborhood died at the hospital three days later on Sunday, and now the suspect may face a murder charge, police said. Sami Batshoun, 85, of San Francisco, who owned the North Beach Food Mart for more than 20 years, was knocked to the ground as a thief ran from the store near Columbus Avenue and Lombard Street around 4:10 p.m. Thursday, according to police Officer Robert Rueca and the medical examiner's office. Batshoun was injured and was taken to a hospital, where he died Sunday, Rueca said. The suspect, a 31-year-old man, was arrested and taken into custody on Thursday on suspicion of elder abuse and burglary, Rueca said. The 85-year-old man was probably knocked down accidentally as the suspect fled, Rueca said. "I don't think this suspect intended to commit murder, but if someone dies in the commission of a crime," homicide enters into the picture, he said. "I don't have information as to whether this person is still in our custody, but if he is in custody," homicide would be added to the crimes of which the man is suspected, Rueca said. "If he is not in custody, we would have to find him and take him into custody" on suspicion of homicide, he said. Fellow business owners in the area were mourning one of their own. Sami was my neighbor, my tenant, my friend, such a nice, nice guy, and we’ll all miss him," Amy Louie said. Paul Sanchez runs a nearby sign business. "I’ve been pretty much on edge the last few days, thinking about him and the family," Sanchez said. "I really feel for the family and for the community. I think it has really shaken up North Beach quite a bit."